Treasures from ancient Egyptian cities, lost under the sea for 1,200 years now fill galleries at the Minneapolis Institute of Art. 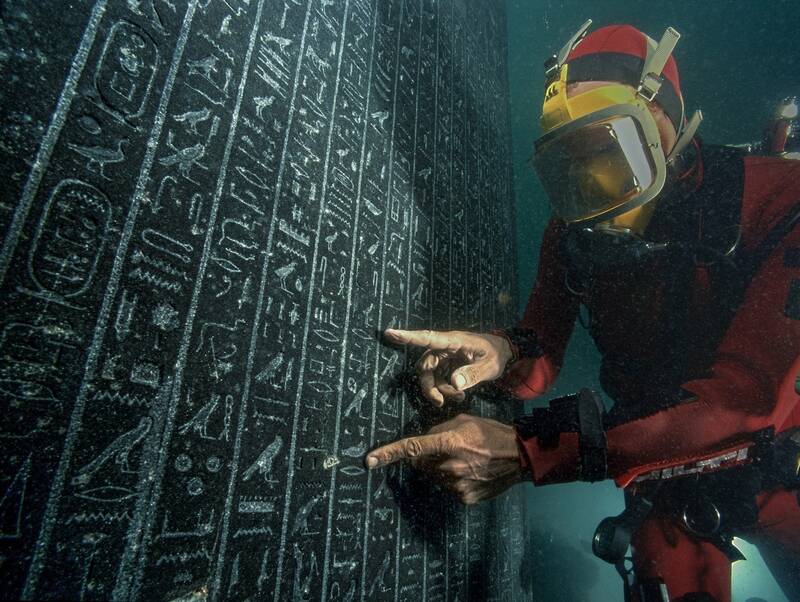 Discoveries exhibited in the show "Egypt's Sunken Cities" solved mysteries that puzzled historians and Egyptologists for centuries. 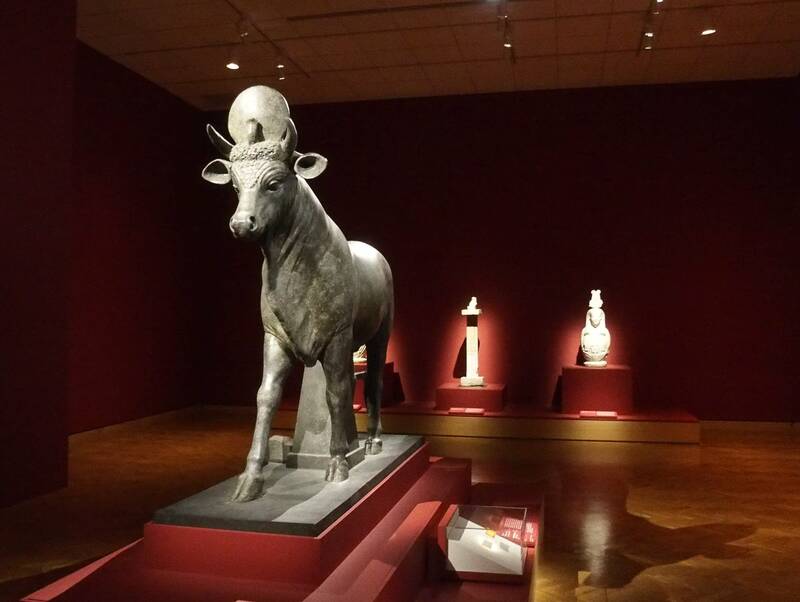 There are hundreds of artifacts on display: statues, ritual objects and religious images. There is jewelry so small you need tweezers to pick it up and there are three colossi — huge statues of a pharaoh, a queen and the hermaphrodite god Hapy, each weighing thousands of pounds. Looking for ancient Egyptian artifacts is never easy: even if you don't believe the stories of potent curses. But the Egyptologists searching for the legendary cities of Canopus, Thonis and Heracleion also dealt with the catastrophic effects of an earthquake and a tidal wave centuries ago. "Our challenge was those sites had been swallowed by the sea in a matter of a few seconds," said Franck Goddio. Goddio is president of the European Institute of Underwater Archaeology. Using clues gathered from ancient writings and a specially developed magnetic resonance undersea mapping system he and his team searched the Mediterranean's sandy floor near the mouth of the River Nile. "Nothing was visible when you were diving underwater because you had a lot of sediment, everywhere," he said. They found Canopus first, just offshore. Then 5 miles out, Goddio's magnetic system found a shape he recognized, that of an ancient Egyptian temple. Down his team dived to burrow into the sand and sediment. "And we went 1.5 meters — nothing! One-point-eight meters — nothing! Two meters, and we started to see a kind of a cone, a kind of a red granite pyramid. Thus we were excited, and we went on digging, digging, digging and that monument appeared. It was the naus of the temple, that means the holy center of the temple." The naus is one of the first things visitors see when they arrive at the "Sunken Cities" exhibit. It's not huge, the size of a small closet, but the Egyptians believed it contained a god. 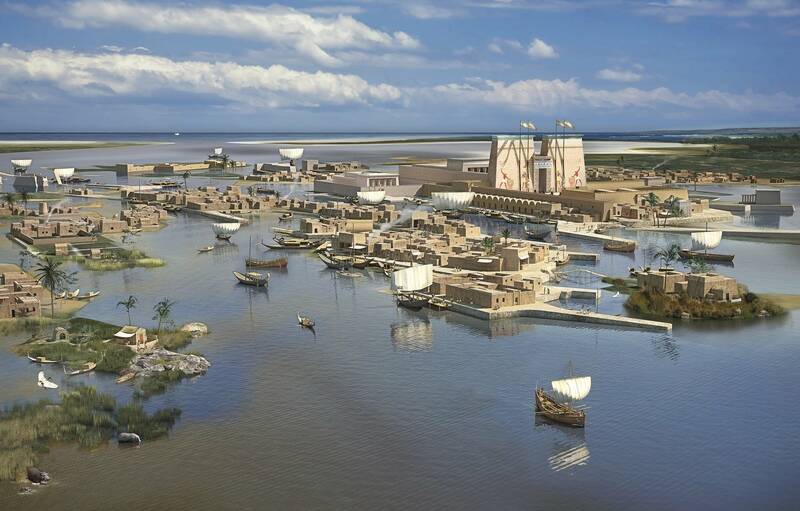 The underwater archaeologists had found the temple of Amun-Gareb dedicated to the god Osiris. They also found hieroglyphs proving, despite what the historians believed, that Thonis and Heracleion were actually the same city. 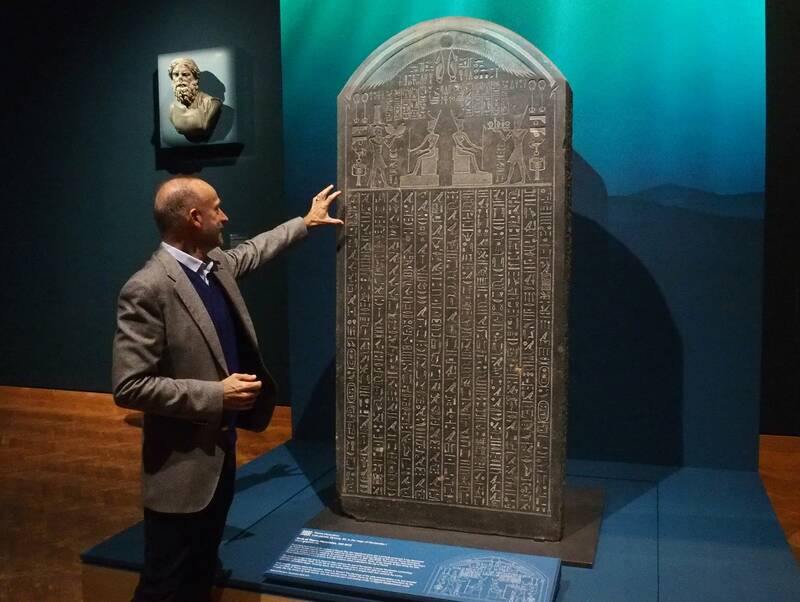 The hieroglyphics on a massive tablet they discovered also contained so many curses against the nation's enemies one expert called it the Egyptian atomic bomb. Surrounded by a wealth of objects gathered from the expedition, Goddio says this temple was a vital part of Egyptian life, and in particular the Pharaoh. "And every year, in all (the) important temples of Egypt there was a special celebration called the Mysteries of Osiris." During the 23-day-long ritual, Pharaoh entered the temple to connect with the gods, and as a result, guarantee his power. Mostafa Waziry joined Goddio during a preview tour of the show. 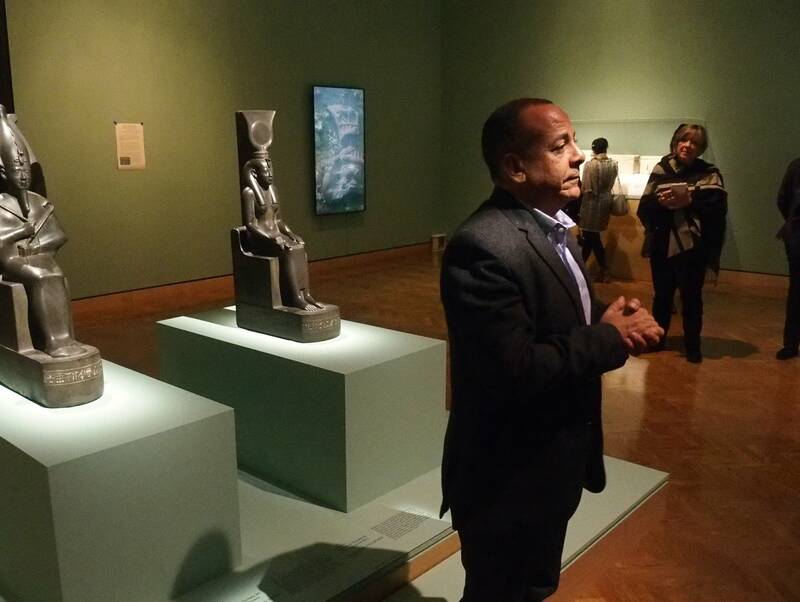 He is no less than the secretary-general of the Supreme Council for Antiquities in the Arab Republic of Egypt. "Can I ask you kindly to pay attention for this coming lovely interesting story?" asked Waziry. Having led many digs himself he's steeped in the complex story of the ancient Egyptian pantheon. "Egyptians in ancient times, they were really smart guys," Waziry began. "They said, who created the world?" It takes a while to tell the story, but Osiris emerges as the god of the afterlife and rebirth. The Mysteries of Osiris rituals perpetuated his role in the sprouting of vegetation and the fertile flooding of the Nile. The actual ceremony remained secret for 4,000 years until Goddio's team unearthed the ritual objects. Many are in the show. When the Greeks became the dominant force in the Mediterranean, Osiris morphed into a new god Serapis. Goddio points to an ancient statue of him they found in Canopus. It offers visitors an opportunity. "And you can look at him and make a wish," he said. "Because according to ancient texts Serapis in Canopus made miracles for over 600 years," he said. Which may be worth the price of admission in itself.